The Pirate Sports Net class at Pattonville High School is once again broadcasting home football games and other athletic competitions as they are able. Pirate fans can view live streams of the games on the PattonvilleTODAY Facebook page or the class website at PattonvilleTODAY.com/LIVE. The Pirate Sports Net class provides sports news and content for PattonvilleTODAY, the school’s online journalism hub, and is a production-centric course designed to provide fans with a front-row seat to school athletics. The class originated last school year and is focused on the art of sports storytelling, including how to go behind the players’ stats and game scores to report compelling stories, how to break news across multiple media platforms and what sports and media mean to our society. 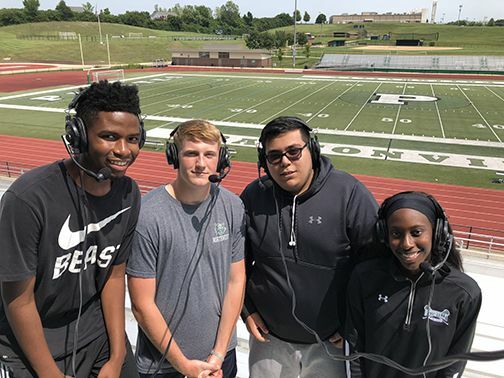 To kick off this year's broadcasting season, Mike Johannes from the Pattonville technology department assisted seniors Mikayla Bridges, Brandon Clark, Jorge Coronado and Ja’Sir Gillum and teacher Brian Heyman with setting up equipment in the Pattonville stadium and conducting a trial run on their first game day, the Pirates' game against Columbia Hickman. This year, the students are operating with new headsets and microphones purchased with a grant from the Pattonville Education Foundation. Pirate sports fans can find schedules for their favorite team sports at pirates.psdr3.org. Students in the Pirate Sports Net class prepare to live stream the first home football game. They are, from left, Ja’Sir Gillum, Brandon Clark, Jorge Coronado and Mikayla Bridges.